Argentina's Armed Forces seized power from Isabel Perón on March 24, 1976, leaving in their wake some of history's worst recorded human rights crimes. Streets and plazas across Argentina were flooded with people on Sunday, as the country commemorated the 43rd anniversary of the 1976 coup d'état that brought to power a military dictatorship responsible for some of the worst recorded human rights abuses of the last century. As in previous years, the 43rd anniversary featured two near simultaneous marches. On the one hand, human rights groups like the Grandmothers of Plaza de Mayo and Mothers of Plaza de Mayo-Founding Line, aligned with the former Kirchner governments; and on the other, leftist groups associated under the umbrella of Encounter for Memory, Truth and Justice (EMVJ), an independent human rights coalition. Argentina's Armed Forces seized power from Isabel Perón on March 24, 1976, leaving in their wake some of history's worst recorded human rights crimes. The military was responsible for tens of thousands of disappearances, exiles and executions in clandestine detention centres. 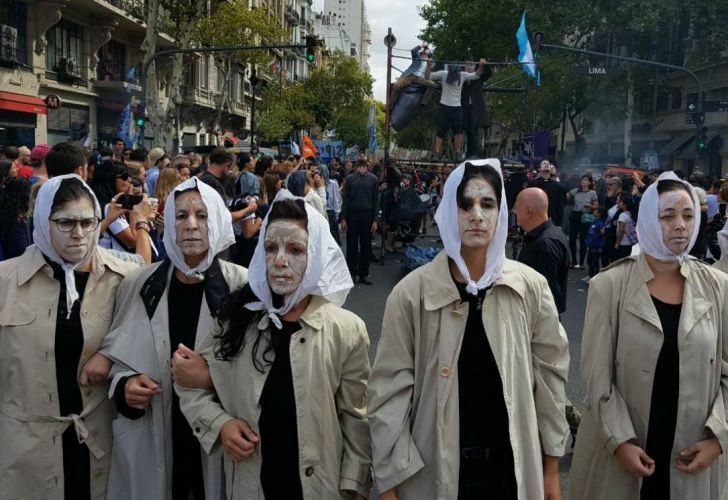 "This is not a date for celebration, instead it's for remembrance," said the president of Grandmothers of Plaza de Mayo Estela de Carlotto, who read aloud an official document prepared by human rights groups. The anniversary of the coup, she said, "should bring answers" to Argentine society. "Society should not remain in the dark about such a serious part of its history, which was totally clandestine. And for this reason, this darkness and uncertainty has worn us down for so many years. 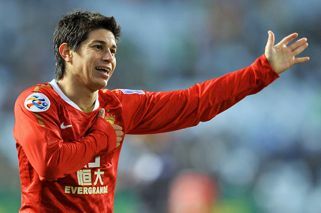 But there is persistence and heirs to continue this fight," she added. "We're certain that the coming generations will continue with these demands." Carlotto praised the work of the courts in bringing human rights abusers to trial, but took aim at those responsible for the execution of the dictatorship's crimes. "All those responsible for this genocide are being tried in regular courts with the right to a defence. They do not confess nor show remorse, and they promise to do what they did all over again if it were necessary," she lamented. 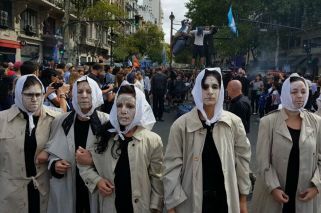 Relatives of the disappeared carried their famous blue banner – more than 500 metres in length – with the faces of their missing loved ones, including some of the last surviving Mothers of Plaza de Mayo. The march was heavily political, with continuous chanting heard throughout the day against the Mauricio Macri government. Ex-president Cristina Fernández de Kirchner, who did not attend, dedicated some of her time on the day to tweeting criticism of the Macri administration, seeking to link the dictatorship's crimes and policies with the current government. The Unidad Ciudadana leader has yet not confirmed if she will run for president, though most analysts believe she will. The former head of state, who was elected senator for Buenos Aires province in the most recent midterm elections, posted: "Yesterday and today: adjustment of salaries and pensions, the destruction of national industry, [an] increase in poverty, [the] financial bicycle and persecution of political opponents. Same policies, same results." Among those who actually attended the event – Fernández de Kirchner reportedly watched it from a television set at her home in the swanky Recoleta neighbourhood of the capital – were La Matanza Mayor Veronica Magario, Esteban Echeverría Mayor Fernando Garay, Malvinas Argentinas Mayor Leonardo Nardini, lawmaker Fernando Espinoza, and the former speaker of the Lower House Julian Domínguez. For their part, the Kirchnerite youth movement, La Campora, led by lawmaker Máximo Kirchner and former Economy minister Axel Kiciloff marched in a procession from the ex-ESMA Navy Mechanics School clandestine detention centre in Nuñez to Plaza de Mayo. Among leftist leaders in attendance were Nestor Pitrola, Alejandro Bodart and Myriam Bregman. "We are here to reclaim the struggle of those 30,000 compañeros and compañeras who are no longer with us," said marcher Pablo Rueda, a 29-year-old artist. "This mobilisation is happening so that what happened then will never happen again," added Diana Lombardo, a 65-year-old doctor who attended the rally.